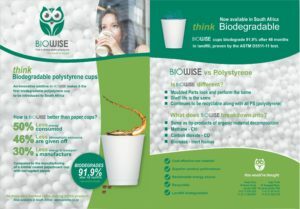 Introducing Biowise Cups – a really exciting innovation! Foam Cups that look and feel like polystyrene but are 100% biodegradable. Available in 175ml (R20 for 25 or R569.30 for 1000) and 250ml (R22.50 for 25 or R655.50 for 1000).